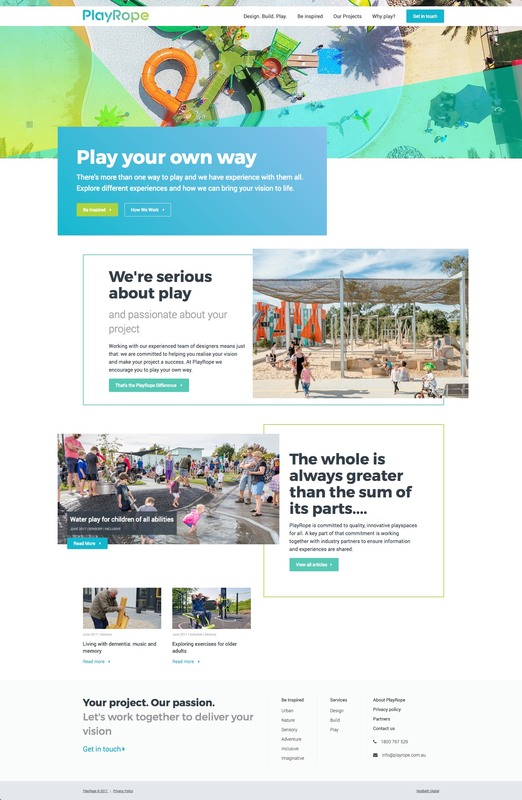 Playrope engaged Mudbath to facilitate in the redevelopment of their website to communicate their core values and ideologies while encapsulating three of their businesses that sat under their main brand. Playrope wanted to ensure that their website was visually inspiring through the use of high quality images and 3D renders of project equipment. Furthermore, Playrope wanted to educate their potential customers on their unique process and the value it offers in the end result of their playground equipment. During the workshop we uncovered that the website purposes was not to try and specifically sell products, but instead, engage clients in a more complete way to build stronger working relationships in the future. We uncovered that the project goal was to inspire new and current clients to engage in the journey with playrope. Through persona exploration we also uncovered that it was less relevant to identify users by type and more useful to group them by project scale. We then looked at the two ends of the scales to assess how large and small project users differ in wants and goals. After the persona exploration we analysed the current weaknesses of the website against some of their competitors and created a new user flow that inspired users as a key motivation to explore the site and contact playrope directly. Layout and grid were our main focus for the prototype. We wanted to guide the users through the website by catering for multiple ways of accessing information. Playrope create incredible playgrounds, we always wanted to feature the photography of the playgrounds as the focal point. Our layout brings the content to the forefront to complement the photography. We paired this layout with clean pallete and bold typography. The site went live on Monday the 3rd of July 2017. We are now working with Playrope to create another website for their New Zealand Branch.